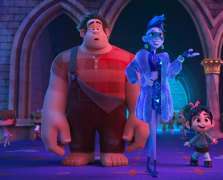 This sequel to Wreck It Ralph sees our animated heroes Ralph and Vanellope emerging from the (relatively) safe world of the video game archive to find themselves lost and immersed in the uncharted territories of the internet. "...another fun-filled adventure, with much to be enjoyed..."
Created by the minds that brought us the alternate universe that was Zootopia, the film once again features the voice talents of John C. Reilly and Sarah Silverman as Ralph and Vanellope, along with Taraji P. Henson, Gal Gadot and Alfred Molina (plus local heroine Kelly Macdonald reprising her role as Merida from Brave). Full of references to all things world-wide-webbed, this is another fun-filled adventure, with much to be enjoyed as our heroes enter a whole new world of the strangely familiar presented from a very different – and very animated – perspective.